Folks, if you teach stats in middle school or high school, 2019 is your time to shine. Here are a couple of items where the world needs your help and one way where the world (a/k/a Desmos, the New York Times Learning Network, and the American Statistical Association) is here to support you. Here is a clip from 60 Minutes in which Congresswoman Alexandria Ocasio-Cortez proposes a 70% top marginal tax rate. Suppose that your income put you at the very top of the 28% tax bracket and you earned one more dollar such that you were now in the 33% tax bracket. My tax bill would go up a very small amount. My tax bill would go up substantially. Only 52% of respondents correctly answered that their tax bill would go up a very small amount. Democrats answered that question correctly nearly twice as often as Republicans, a difference which is amply explained by all the Republican leaders who are smart enough to know how marginal tax rates work lying to people about how marginal tax rates work. We need to help our students – whatever their political inclinations – believe fewer lies. There are lots of interesting questions our students (and their teachers!) should ask about taxes and the kind of society they want to live in, questions like “What are the upsides and downsides of making Dwayne ‘The Rock’ Johnson pay 70% of the money he makes above 10 million dollars in taxes?” But we cannot answer those interesting questions if we don’t have a basic command of the facts of our tax system, if we allow our leaders to deceive us about how marginal tax rates work. Stats teachers: you have the power to make your students smarter about taxes in a day than fully half of Americans have been in their entire lives. Take a few representative individuals from the world – real or imagined, but definitely including The Rock. Hypothesize their income. 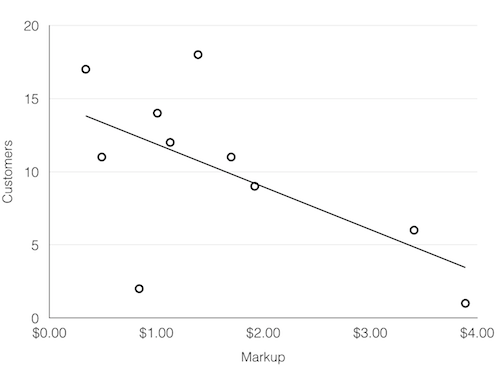 Just make up numbers across an income distribution. Use our tax brackets to calculate their tax bill. Create a new set of brackets that are more just. 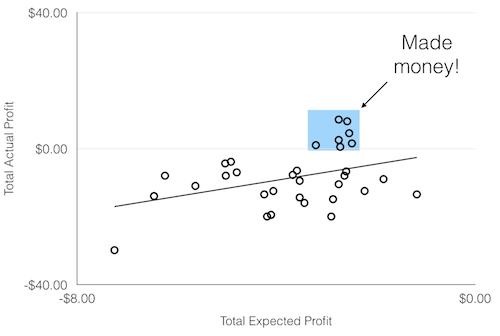 At Desmos, we’ve been enormously enthusiastic about the partnership between the New York Times Learning Network and the American Statistical Association they call What’s Going on in this Graph? In that partnership, the NYT team selects a newsworthy and timely graph from their award-winning output. The ASA team hosts a conversation on the NYT website about what students notice and wonder about those graphs. For the rest of the school year, my team at Desmos will be helping teachers host those conversations in their classrooms from our Activity Builder platform. A new graph and activity every week. Give them a try. There’s no time like 2019 to start all of this. While the information about Americans misunderstanding taxes did not surprise me, your choice to bring politics into the situation did. How do you propose we use your information about the tax knowledge of Democrats vs. Republicans with our students? Should we poll the students on their political affiliation and spend twice as much teaching taxes to our Republican students as we do our Democrat students? The difference in tax knowledge between Democrats and Republicans along with the propensity of Republican leaders to lie to their constituents about marginal tax rates is meant to heighten the importance of good instruction here. Whether students grow into Republicans or Democrats is irrelevant to me (in this particular moment). If they or their parents pay attention to Republican leaders or media, they are getting lied to about this particular issue and we can do something about that. You’ve made this particular mail also about politics. Roughly: “Dem/good Repub/bad” Does that serve your core goal (statistics pedagogy)? Thanks for this free service. I hope to read the next one. FWIW I’m more inclined to believe “people/bad” than “Democrats/good” “Republicans/bad.” But it certainly seems true that Republican leaders are willing to lie about this issue and that Republican voters are believing those lies. Teachers can and should subvert that relationship. Not necessarily converting Republicans to Democrats but making sure Republicans disbelieve their leaders when they lie. This sort of proselytizing does nothing but polarize. You’re taking advantage of those who follow you for your insights with math education to preach your opinion about complex, controversial political topics that require nuanced thought and discussion to resolve. Have you ever changed your mind due to other people smuggling in their unsolicited opinions about politics like this? If you’re looking to change people’s minds about politics, do it through an open, honest platform where that is your sole purpose. I hope you stick to math without trying to fit in other agendas that distract from this purpose in the future. I get that it’s a drag to see a) Republican leaders lying to their constituents, and b) their constituents believing those lies, but those aren’t “opinions” of mine. They’re the facts of the situation, and teachers need to work an overtime shift countering that deception. I hope that directly before or after you emailed me you emailed a complaint to the Republican leaders who are making your job harder. When I was at university, we would have been required to present various viewpoints on an issue. Our professors would have required us to present pros and cons for each side. For examples, [dopey climate denier webpage] would give an alternative for our students to consider. Thanks for the comment. Some issues are controversial enough that they deserve a hearing of multiple sides. Many other issues deserve no such hearing. The fact that “global climate change caused by human activities is occurring now, and it is a growing threat to society” is a settled issue by climatologists, our government, the military, and even for=profit insurance agencies. Now we need to decide what to do about it. By contrast, whenever I write my post declaring The West Wing the most overrated show of the 20th century, I will be sure to allude to opposing points of view. In true Dan style, I didn’t want to script this too much. Together, we wrote the seven marginal tax rates on the board. I then asked how much extra tax one would pay if they received a $10,000 raise. This allowed the kids to learn that some of the money is taxed at one rate and the rest at another. We then considered someone who earns $520,000 a year. How much of that salary would be taxed at 37%? In their groups, they collaborated to determine the total tax bill on $520,000. We determined that effective tax rate. Each class had at least one student who asked “why can’t we just make life easy and use that effective rate for everyone?” Rich discussions ensued. We discussed the many who fear moving into the next tax bracket and why such a fear was unfounded. We discussed a representative’s proposal to move towards a higher upper bracket of 70% , historical higher rates, the number of folks that might be affected and whether one would pay 70% on all income as a high earner. I started to type up a worksheet but it seemed to scripted/guided… and it didn’t come from their questions and their desire to be better informed than an adult. Eight years ago, this XKCD comic crossed my desk, then into my classes, onto my blog, and through my professional development workshops. That single comic has put thousands of students in a position to encounter the power and delight of the coordinate plane. 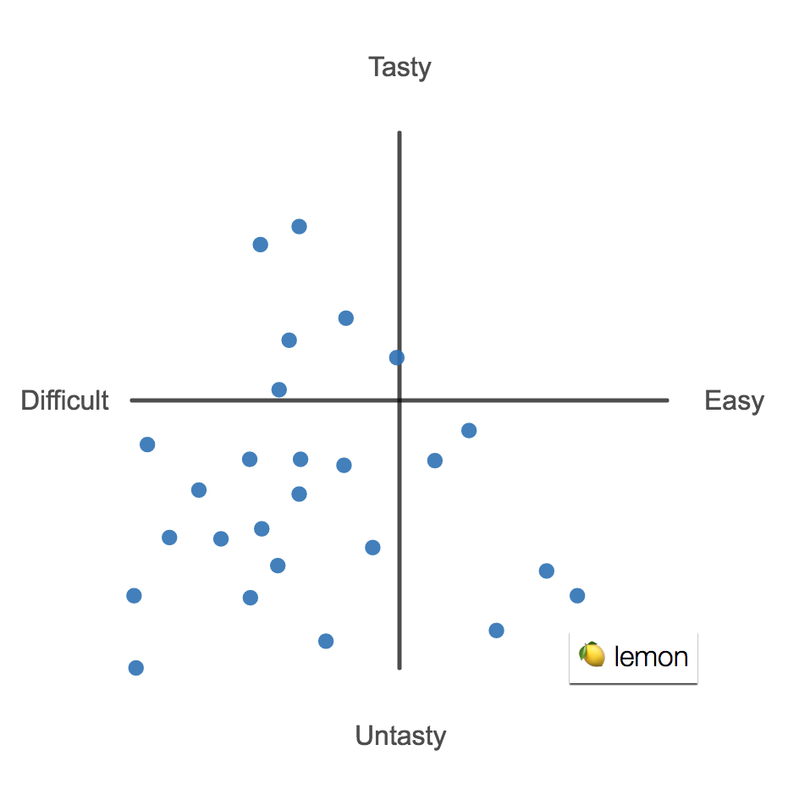 But I’ve never been happier with those experiences than I was when my team at Desmos partnered with the team at CPM to create a lesson we call Pomegraphit. 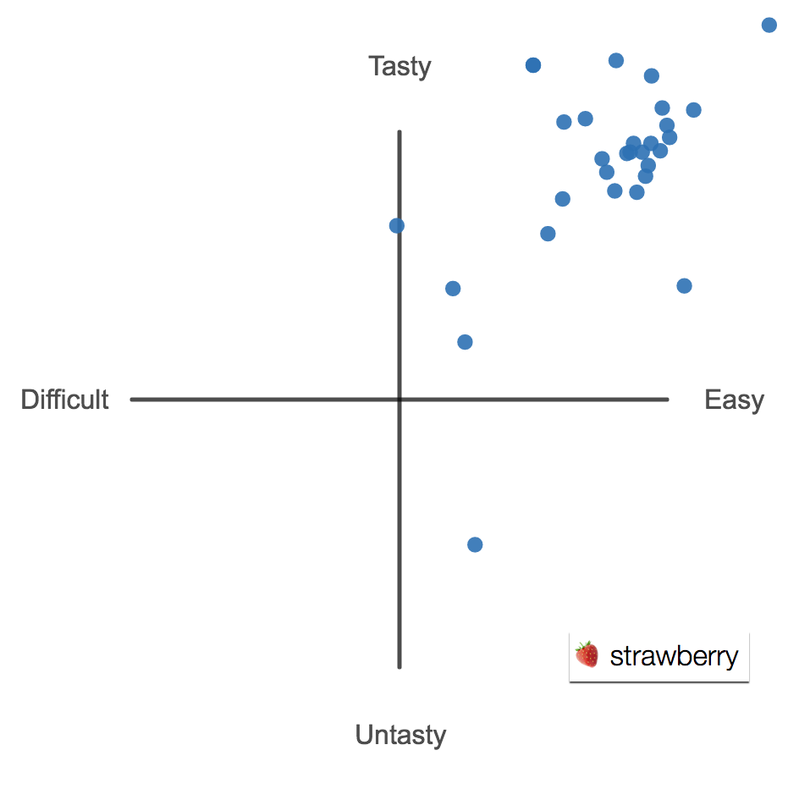 Here is how Pomegraphit reflects some of the core design principles of the teaching team at Desmos. Ask for informal analysis before formal analysis. 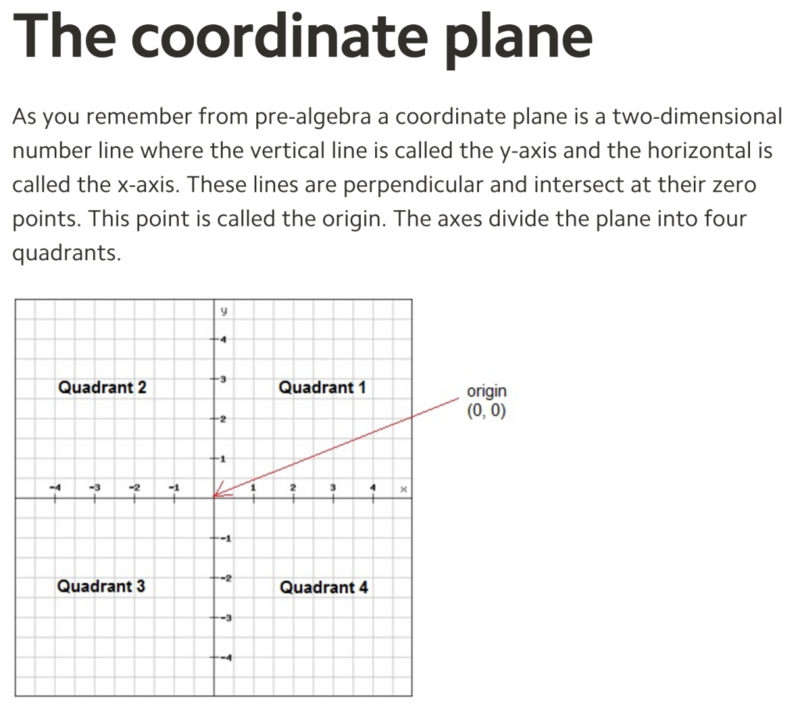 Flip open your textbook to the chapter that introduces the coordinate plane. I’ll wager $5 that the first coordinate plane students see includes a grid. Here’s the top Google result for “coordinate plane explanation” for example. A gridded plane is the formal sibling of the gridless plane. The gridded plane allows for more power and precision, but a student’s earliest experience plotting two dimensions simultaneously shouldn’t involve precision or even numerical measurement. That can come later. Students should first ask themselves what it means when a point moves up, down, left, right, and, especially, diagonally. So there isn’t a single numerical coordinate or gridline in Pomegraphit. Delay feedback for reflection, especially during concept development activities. It seemed impossible for us to offer students any automatic feedback here. 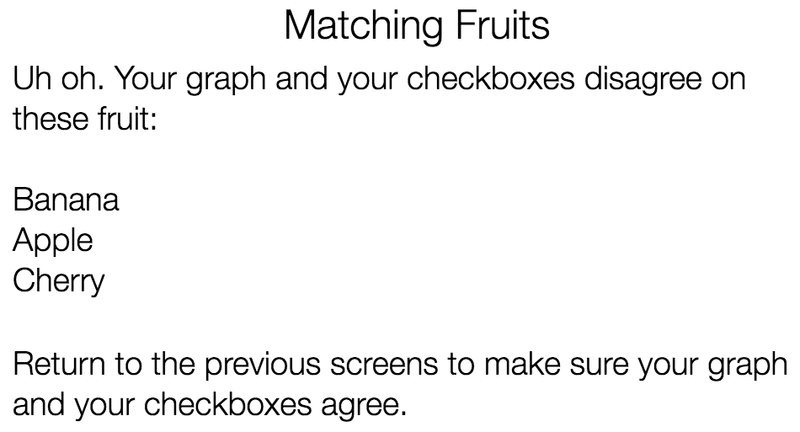 After a student graphs her fruit, we have no way of telling her, “Your understanding of the coordinate plane is incomplete.” This is because there is no right way to place a fruit. Every answer could be correct. Maybe this student really thinks grapes are gross and difficult to eat. We can’t assume here. So watch this! 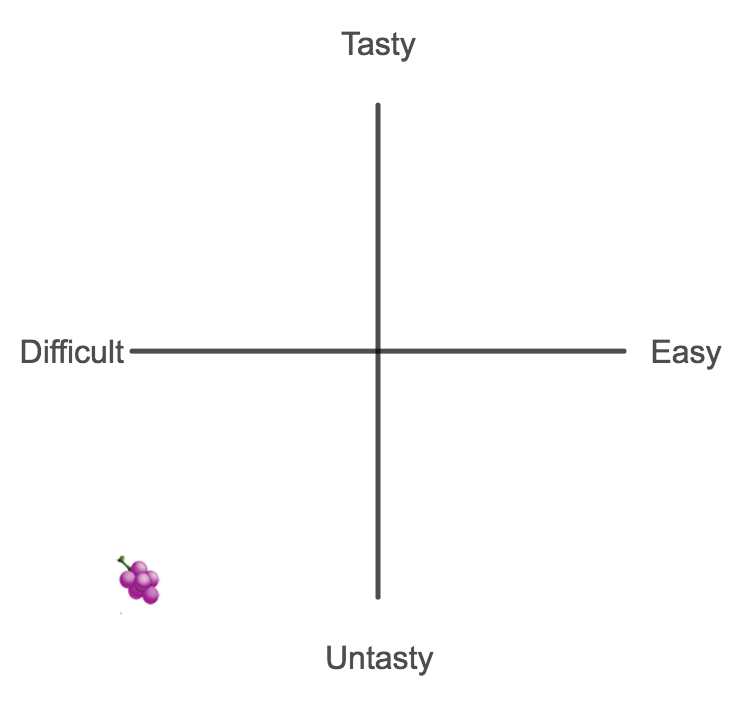 We first asked students to signal tastiness and difficulty using checkboxes, a more familiar representation. Then it’s up to students to bring those two representations into alignment, bringing their understanding of both representations up to the same level. 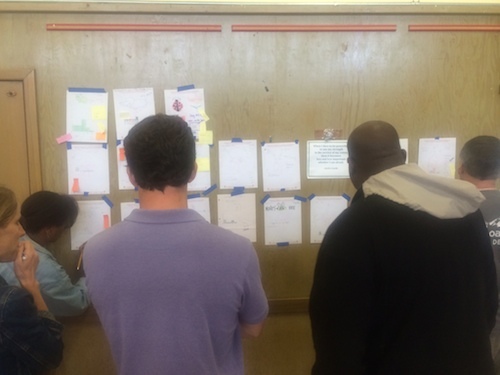 Create objects that promote mathematical conversations between teachers and students. Or is it the strawberry? What will it be in your classes? Find out and let us know. 2017 Jun 16. 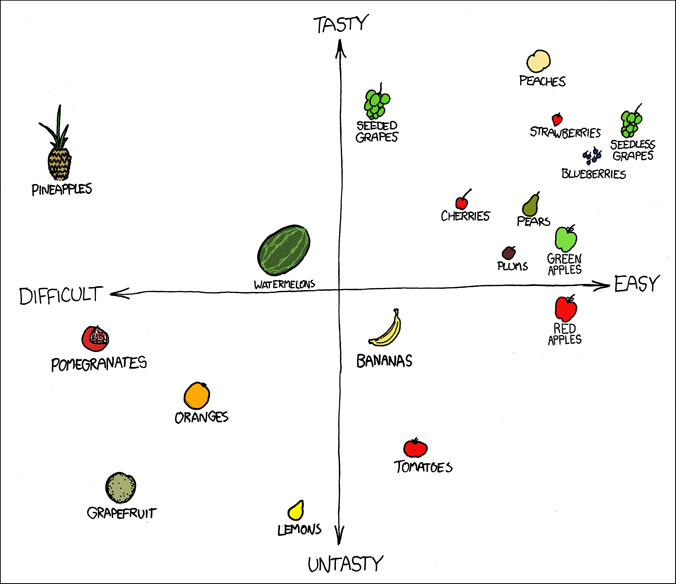 Ben Orlin adds several different graphs of his own. Delete his objects and ask your students to choose and graph their own. Then show Ben’s. I know. I know. Too early, right? But Ali Grace is a go-getter. Ok #MTBoS. What's your favorite first day of school activity? For high school. Something that helps me get to know my students?? Help the rest of us out in the comments. What do you do on the first day of school? 2016 Jul 27. A Collection of First Week Activities. 2017 Aug 21. Sarah Hagan has 21 ideas for the first week of school. 2017 Aug 21. YouCubed has its Week of Inspirational Math. 2017 Aug 21. Sara Van Der Werf’s 100 Numbers to Get Students Talking. In my modeling workshops this summer, we first modeled the money duck, asking ourselves, what would be a fair price for some money buried inside a soap shaped like a duck? We learned how to use the probability distribution model and define its expected value. We developed the question of expected value before answering it. Then the blogosphere’s intrepid Clayton Edwards extracted an answer from the manufacturers of the duck, which gave us all some resolution. 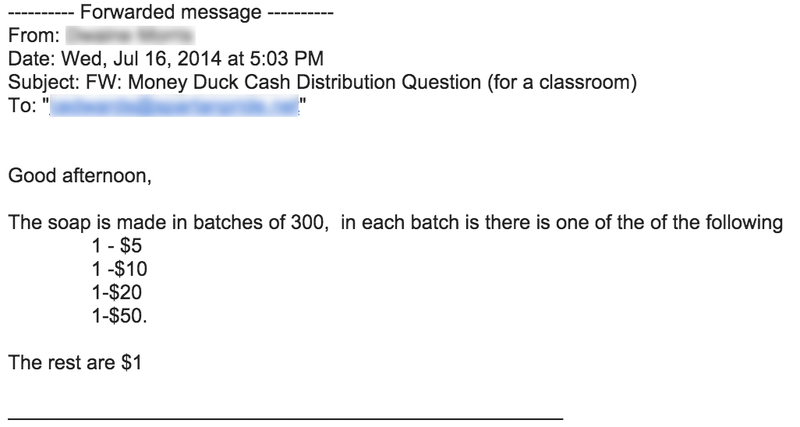 For every lot of 300 ducks, the Virginia Candle Company includes one $50, one $20, one $10, one $5, and the rest are all $1. That’s an expected value of $1.27, netting them a neat $9.72 profit per duck on average. They’re only able to get away with that distribution because competition in the animal-shaped cash-containing soap marketplace is pretty thin. So after developing the question and answering the question, we then extended the question. 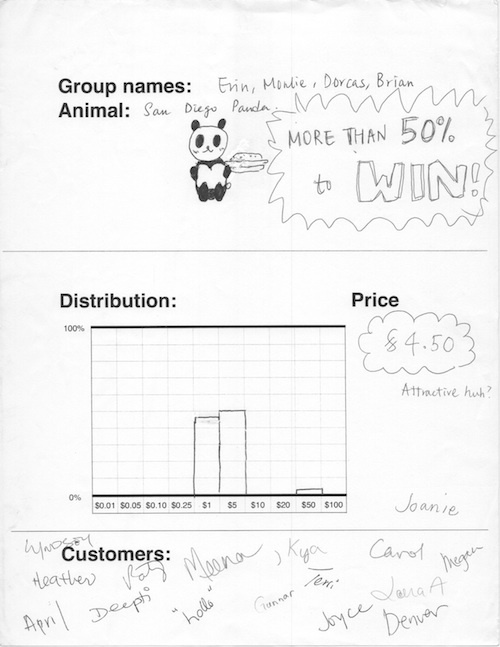 I had every group decide on a) an animal, b) a distribution of cash, c) a price, and put all that on the front wall of the classroom – our marketplace. They submitted all of that information into a Google form also, along with their rationale for their distribution. Then I told everybody they could buy any three animals they wanted. Or they could buy the same animal three times. (They couldn’t buy their own animals, though.) They wrote their names on each sheet to signal their purchase. Then they added that information to another Google form. 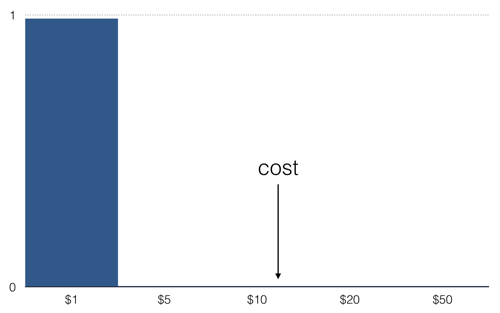 Given enough time, customers could presumably calculate the expected values of every product in the marketplace and make really informed decisions. But I only allowed a few minutes for the purchasing phase. This forced everyone to judge the distribution against price on the level of intuition only. Look at the price! Look at the distribution! You’ll walk away a winner over half the time, a fact that their marketing department makes sure you don’t miss. And yet their expected profit is positive. Over time, they’ll bleed you dry. Sneaky Panda! I took both spreadsheets and carved them up. Here is a graph of the number of customers a store had against how much they marked up their animal. 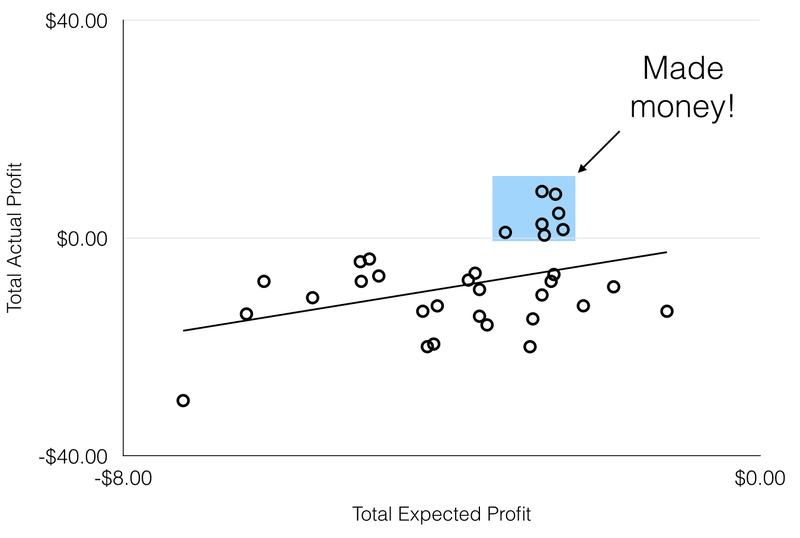 So in the mathematical world, because all the businesses had given themselves positive expected profit, the customers could all expect negative profit. The best purchase was no purchase. Javier won by losing the least. He was down only $1.17 all told. But in the real world, chance plays its hand also. I asked Twitter to help me rig up a simulator (thanks, Ben Hicks) and we found the actual profit. Deborah walked away with $8.52 because she hit an outside chance just right. 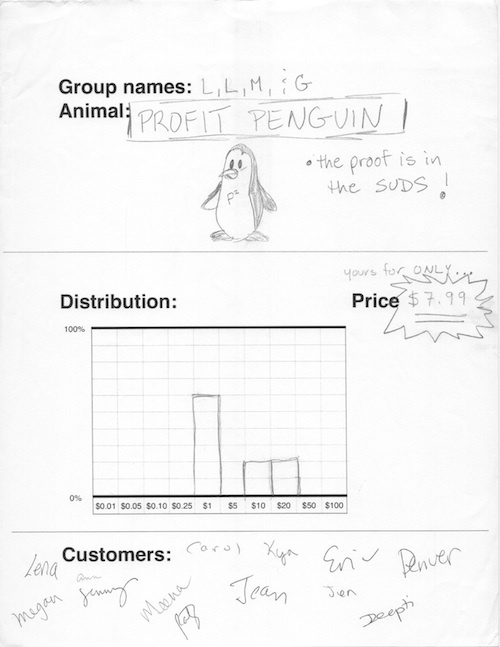 Profit Penguin was the winning store for both expected and actual profit. Keep the concept simple and make winning $10s and $20s fairly regular to entice buyers. All bills – coins are for babies! We’ve talked already about developing the question and answering the question. Daniel Willingham writes that we spend too little time on the former and too much time rushing to the latter. I illustrated those two phases previously. We could reasonably call this post: extending the question. To extend a question, I find it generally helpful to a) flip a question around, swapping the knowns and unknowns, and b) ask students to create a question. I just hadn’t expected the combination of the two approaches to bear so much fruit. I’ve probably left a lot of territory unexplored here. If you teach stats, you should double-team this one with the economics teacher and let me know how it goes.